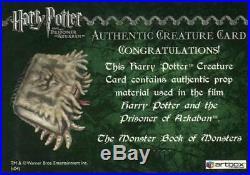 Description: Harry Potter and the Prisoner of Azkaban Update The Monster Book of Monsters Dealer Incentive Prop Card. Authentic 10 Case Dealer Incentive Prop Card (#255/310) featuring prop material from The Monster Book of Monsters used in the film Harry Potter and the Prisoner of Azkaban. 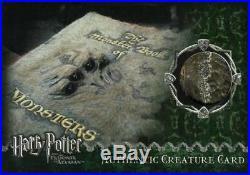 The item "Harry Potter Prisoner Azkaban Update Monster Book Prop Card HP #255/310" is in sale since Wednesday, May 2, 2018. This item is in the category "Collectibles\Non-Sport Trading Cards\Harry Potter Movie Cards\Trading Card Singles". The seller is "barringtoncards" and is located in Island Lake, Illinois. This item can be shipped to United States, all countries in Europe, Canada, Japan, Australia.